Whether you're a seasoned article writer or new to Wizzley and content creation, A Writer's Guide to Wizzley is a gem of a book which you'll want to refer to over and over again. When most new writers enter the world of content creation they are completely unprepared for the skills which they need to develop and the problems that they may encounter along the way. Then there's the jargon to decipher- I say this as a woman who first believed that bounce rate was the number of articles which could be produced in a single day. A Writer's Guide to Wizzley is a gem of a book. It answers every conceivable question which a new, or indeed seasoned writer, needs answering. Whether you are just starting out on your Wizzley writing journey, or have been around for a while, this book will leave you feeling motivated, inspired but above all informed. Introduction to the Author; Jo Harrington. Those members of Wizzley who've be around for while will be all too familiar with the woman who penned A Writer's Guide To Wizzley, Jo Harrington. Among the Wizzley family Jo is the writer who arrived here shortly after the sites creation, with only a little experience but an unquenchable thirst for knowledge and levels of energy which could only be described as super human. If this last sentence sounds like an exaggeration, allow me put it another way; within 12 months of joining Wizzley Jo had created almost 400 high quality pages, had amassed the highest number of Editor's Choice Awards of all authors,(think double figures) built an extremely large and loyal following, had her pages read by hundreds of thousands of new and returning visitors and also penned a page which went viral, attracting 80,000 readers in a single day! In all honesty, I could go on listing Jo's achievements since arriving at Wizzley, but I think that's enough for the time being. Even the most cynical among us would surely have to agree that success on this level is not just the result of random good fortune; but determination, dedication and most of all skill. Along the way however Jo has also made some mistakes, which she freely admits. Nevertheless, it was precisely because of those mistakes that Jo was able to perfect and hone her craft, adopting a what works philosophy and applying all that learning and experience with her usual gusto. This is the knowledge which she imparts. It's valuable. Wizzley and the World of Content Creation. The internet is forever evolving, what was once perceived as acceptable practice just a couple of years ago is now seen as out dated, even obsolete. Creating quality content is only part of the formula for success here at Wizzley, or anywhere else for that matter. As any experienced writer will tell you, you will also need to develop some understanding of the internet; and the right and wrong way to approach publishing. Wizzley was established in the wake of major change and upheaval, which left some of the larger, established sites in what could only be described as a state of chaos. A Writer's Guide To Wizzley introduces the reader to this rapidly changing medium; the internet, where it's going, where it's been and why it matters. Making the Grade on Wizzley. It doesn't matter how proficient you are when it comes to the internet, or how user friendly the interface may be, there are always some initial frustrations when first attempting to complete your profile and build that all important first page. Sometimes there's a really obvious step which you may have missed and it can take you hours to fathom where you've gone wrong. Jo Harrington walks you through the process in an easy to follow yet comprehensive way, even down to providing the answers if your picture doesn't load. Wizzley isn't just any old content site, the standards here are high and the ultimate aim is to provide an exceptional user experience for our readers. Thus, the first few pages produced by any new author will be subject to editorial review to ensure that the highest standards are maintained at all times. Naturally, Some new pages will be rejected and, naturally, a new writer may feel that they themselves have been rejected and become tempted to throw in the towel. The author discusses any potential issues in depth; from writing the introductory sentences to topics which you are not permitted to write about; from module placement to where to find images which you can use legally. No stone is left unturned. 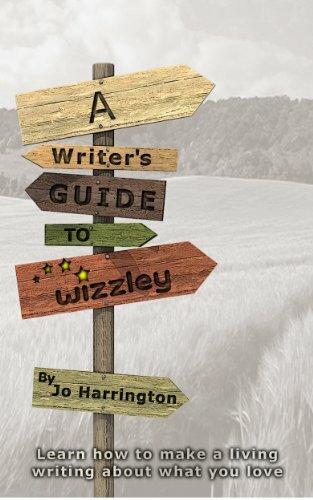 A Writer's Guide To Wizzley by Jo Harrington. Some Wizzley members are here because they love to write, it's as simple as that and money doesn't even enter into the equation. The remainder are here because they love to write and want to either supplement their income, or because this is their day job. Whatever the situation, the founders of Wizzley have ensured that there are ample opportunities to monetize your content. In fact, established writers who join Wizzley are often pleasantly surprised by the number of affiliate partners at their disposal. The author refers to this in her book as the bottom line, which, indeed it is for those wanting to generate an income from their writing efforts. Again the author covers in detail the options available, how to become an affiliate, where to find the capsules and how to add them. But more than this, she explores the finer points of monetizing your content; Google Adsense or Chitika? Which Amazon should you promote? Should you promote Amazon through Viglink? Whatever it is you need to know about monetizing your content here at Wizzley, you'll find the answers on those pages. From the beginning of her journey at Wizzley Jo Harrington has kept a written record of all that she's learnt during her time here. Every fifty pages she has paused to reflect and offered her experience to the rest of us. Her Tips and Tricks. From how to improve your author and page rank to how get on the front page at Wizzley, this is a detailed and comprehensive analysis charting her progress. However, she doesn't just make unsubstantiated claims- she provides the evidence. Her stats are available for the world to see. Jo has included these articles in her book as bonus material. Whether you're taking the tentative baby steps and creating your first page, or looking for inspiration and tips as a more experienced writer, you'll find that Jo Harrington was once in the same place as you, and she'll walk you through the process. Beautifully written and injected with more than a touch of humour, A writer's guide to Wizzley is a gem of a book which you'll want to refer to over and over again. 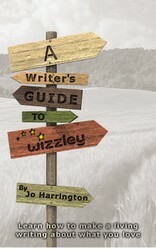 A Writer's Guide to Wizzley is now available in paperback for those who prefer a book or do not own a reading device. Just follow the link beneath through to Amazon.com. Knotafraid - Please don't give up. The only way to win in this game is persistence and constantly out-doing yourself. Try, try, try again and I'm sure that you'll succeed. Pkmcr - Thank you very much. My book is aimed at absolute beginners, so it is a real thrill to know that it's useful for veterans like yourself too. Kimbesa - *blush* Thank you very much. I've never been accused of wisdom before. *grin* Thanks for getting my book and reading it. Hi Peggy, I'm sure you'll find it very valuable. Hi Kimbesa, it's a great resource, whether you're a new or experienced writer. I just read about half of this book, and it IS a gem! I'll be going over it often while I digest all of Jo Harrington's experience and wisdom! Nice to know about this book. We can always keep learning! Don't be discouraged, Knotafraid. Keep plugging away, reading and learning. It isn't you yourself that has been rejected, it simply means that there needs to be some revisions and edits to your page. It's a learning curve, don't give up, just apply the advice. :) You'll get there. You both know how to make me grin like a lunatic. Thank you. IMHO, Wordchazer, you should. I learnt loads and would not give a positive review for a book which I did not think had great value. Coming to get that book as soon as my next editing PayPal lands.